Join us April 19th-21ST for the Emerald Coast Racefest, hosted in conjunction with our friends at Emerald Coast Harley Davidson! 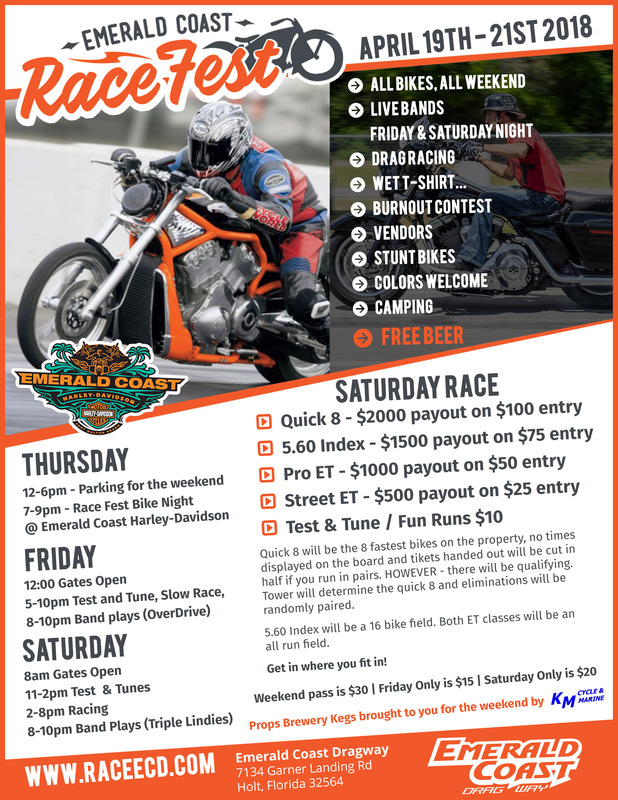 It kicks off Thursday April 19th for a Racefest Bike Night at Emerald Coast Harley Davidson in Fort Walton Beach and the rest of the weekend out at the Emerald Coast Dragway up in Holt. Prepare for a weekend of bike racing, contests, live music, camping and more. A weekend pass is $30 or Friday only is $15 and Saturday only is $20 while kids 12 & under get in free all weekend. If you’e planning on camping all you need is your weekend pass and you’re welcome to setup camp.